This guide shows how you can install Ubuntu 8.10 on a USB flash drive. Ubuntu 8.10 comes with a tool that lets you create a USB startup disk easily - this startup disk behaves like the Ubuntu 8.10 Live-CD. This is useful if you want to install Ubuntu on a computer that has no CD/DVD drive. When you create the USB startup disk, you can also specify that you want your USB system to be persistent between boots (i.e., it does not lose your settings, documents, etc.) - that way you get a fully usable OS that you can carry around in your pocket. You can now plug your USB flash drive into any other computer and start it. Make sure you enter its BIOS to check if booting from USB is enabled and that your USB device is the first device in the boot order. 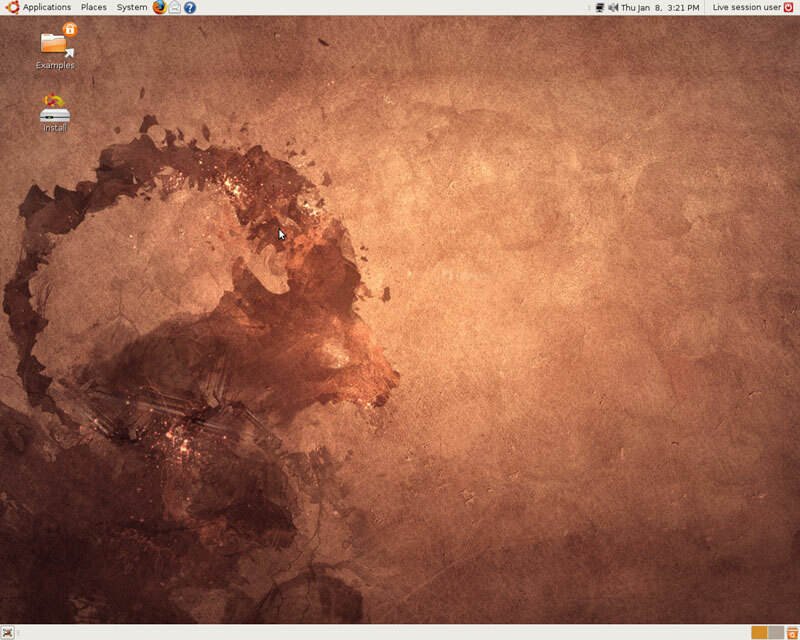 This is how the desktop looks. 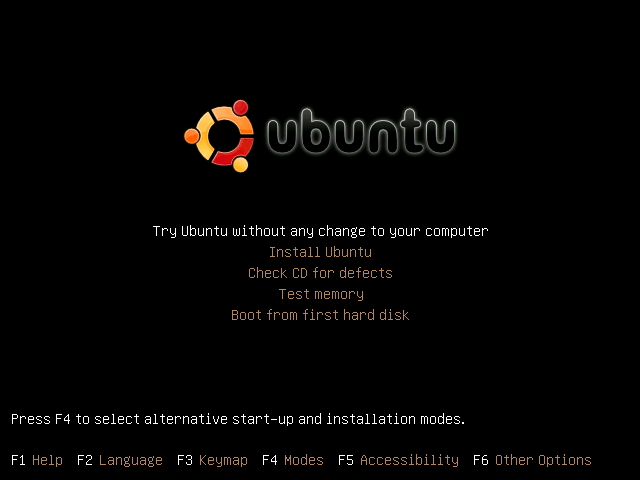 If you want to install Ubuntu to the hard drive, click on the Install icon and follow the installation wizard. If you have chosen to make the startup disk persistent between reboots, you can now use the system like a normal desktop (i.e., it won't lose your documents and settings). I have a 16 GB Patriot flash drive that I have installed the 64Bit version of Ubuntu 8.10. I am using an XFS file system for the root partition. As a result I have to use lilo for the boot manager.The flash drive is the xporter XT. I have had some good luck with it, but you have to understand USB transfers data in parallel transfer mode, just like pata hard drives. Also you are limited to what ever your usb bus's limitations are. I have to wait for things to 'catch up' if I have too many applications running. I am running it on a Dell D630 Laptop with am Intel Core 2 Duo T7100 with 1GB of RAM, I love it! Someone else posted such a comment on another site not too long ago, and the reply was that Ubuntu allowed you to see a USB flashdisk as a normal device (and therefore install to it as such) as long as you pre-partitioned it with Linux filesystems first eg ext2/3, linux-swap etc, and install grub. Whilst I haven't tried this procedure personally, I see an immediate issue with the stress that the swap partition would place on the USB drive (especially the cheaper ones). Possible ways to reduce such cyclic use of the swap partition, would be to use a non-journalling FS like ext2 and risk the loss of data if the power failed, or use a journalling FS like ext3 and mount the partitions with the "sync" option. In both cases and at first boot from the USB, I would also change the swappiness level from the default 60 to a figure closer to 1 (the final figure you opt for would depend on the amount of RAM you have). Thanks for the info. I already tried this and everything went OK in the installation except, when I tried to boot from the USB it failed. I must have had bad GRUB configuration or something. May be I gave GRUB the wrong USB device name. I did not pursue it further since it wasn't a hot priority. I was hoping some one else did it to shed some insight on the details, which you covered some of them. I've been playing with bootable flashdisks for a few months ( Puppy, DSL, and now Ubuntu, Mint and Fedora) and have discovered a few truths, niggles and tips along the way. 1. Not all flashdisks are partitionable and/or bootable, and some that are bootable on one computer may not be bootable on every computer (various problems show up during boot such as "cannot find dir/file" or hardware isn't found properly); there are even inconsistencies between two seemingly identical flashdisks when using the cheaper ones. Sometimes the more expensive stablemates of the cheap versions, also exhibit similar faults. 2. If I find that the flashdisk partitions successfully, I set the boot flag on the partition I wish to boot from, then use "unetbootin" (make sure syslinux is pre-installed, and run unetbootin from a terminal window as root) to install a small distro like dsl, puppy, or macpup from its .iso imagefile. This method installs syslinux, and saves me trying alternative boots (syslinux always works for me). When I reboot, and if the boot is successful, it verifies for me that the flashdisk is fine; where I've been unsuccessful just using the pup install wizard to prepare the mbr, for me, this method works everytime. I then proceed to clear the flashdisk, set it up as I want, and install something like Fedora or Ubuntu using the (live)usb-creator application. Now, if someone else has played with resurrecting a flashdisk that is currently unreadable (after the computer froze while reading from it), I'd appreciate some feedback before I delve more deeply into sg-utils and sd-parm. as far as fixing the flash you can dd it in linux or osx but for windows you will need a low level formating tool they do make a dd.exe for windows so just google it. Another option that might be very nice is to install Linux on a thumb drive from existing installation on a hard drive. 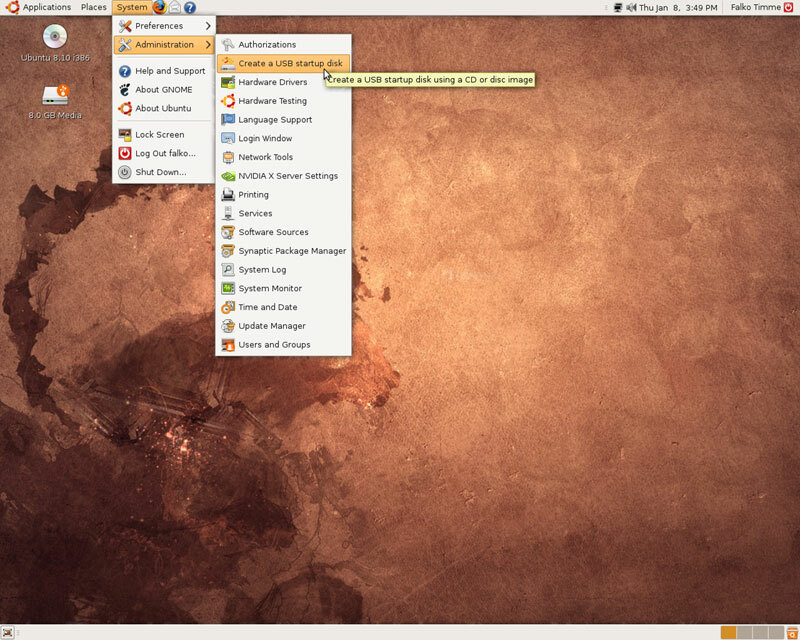 This would be ideal since one can create a duplicate of a current desktop with all the updates and information. May be doable with dd! I could not agree more. Unetbootin is much more easy to use. I tried several different distros on USB stick and it is really a pleasure to work with. Ubuntu should integrate Unetbootin in 9.04 or in 9.10 and/or add Unetbootin to the repo's. I now have iso from several different distro's on an external harddisk. I much prefer Portable Linux from http://rudd-o.com/new-projects/portablelinux because it preserves the free remaining space for usage in other contexts. I don't understand what the problem is. Nobody forces you to buy a subscription. If you don't want to pay and are fine with the HTML version, then what? But as you can imagine from the sheer amount of information on this site, this site cannot be run in our free time. It's a full time project, so people have to be paid. We love Linux and working on this site, but even we have to pay bills, you know... That's why we offer subscriptions to cover a part of our costs. When i push View as PDF or Print, im taken to a subscription page and the reason i pushed the button is nowhere to be found. Could you please put a (require subscription) parenthesis somewhere, this crap reminds me of pornsites trying to hustle memberships. I am new to linux and have bumped into this site a few times and found it very usefull. But im not ready to pay for anything yet. So maybe this site isnt for me, but this kind of crap is still not what i expected. What is needed is a procedure to install K/Ubuntu on a thumb drive as a hard drive so updates/upgrade and every thing else are saved. I know the Thumb Drives are not as durable, but heck I can live with that. Hi i have had success at this after using several different methods i tried something different . Thanks for sharing this. I just started using a tool called unetbootin. 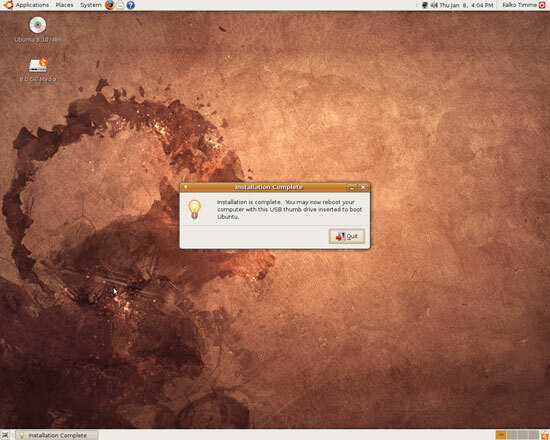 With this tool you can install virtually any Linux distro on your pen drive. It both work in Linux and Windows. Even better, you can also install a distro on your hard drive from your OS. This would have been great a few years ago when I had a laptop with a broken cd and floppy drive and only windows installed on it. Anyway, try out unetbootin too! Sounds quite simple. Is it also possible to add new applications, create then the usb bootstick and use this applications over the live bootstick?